What happened to photos here? Sometimes the auctioneer buys a different camera. Sometimes someone new is hired to take photos of lots. One of our top houses went from the best photography on the portal to mediocre at best, posting washed-out over-exposed photos so that condition cannot be discerned. Washed out photos hide luster, dipping and flaws. We don’t know what happened. What we do know is that we used to bid strong in this auction–not because of the lot descriptions, which tended to be generous–but because of the superior photography. Now we really don’t know what we’re bidding on, and our bids reflect that. Don’t let your photography lapse. It affects the bottom line more than you know. This entry was posted in Best Practices and tagged American Numismatic Association, Auctioneers, AuctionZip, Best Practices, Coin Auction, coin photography, iCollector, National Auctioneer Association, Proxibid, Proxiblog. Bookmark the permalink. Taking photo’s of coins as you know is very difficult, getting the lighting just right without glare and or shadows is difficult. I work hard to represent coins as they are, but on a recent coin auction of mine (not this example) I did an auto-correct on the photo manager… After I had done so, I did question myself as to if I did the right thing… It is quite possible, this seller used the auto correct feature thinking they were doing the right thing. 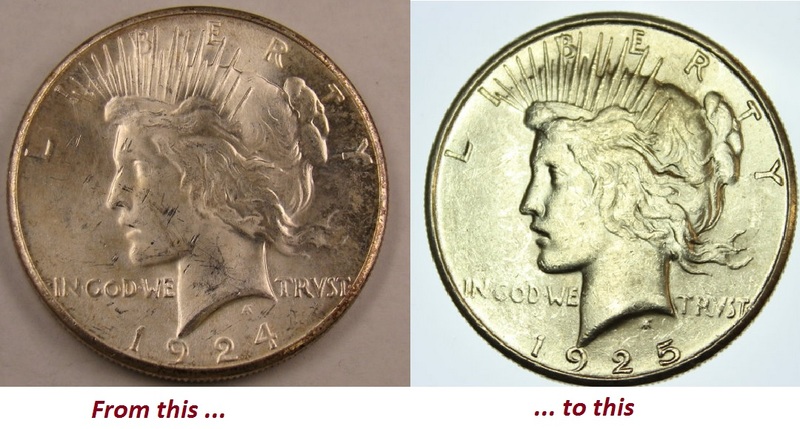 Here are three helpful things to do when taking pictures of coins without spending a lot of money. 1) building an adjustable jog to hold the camera, I used an old photo enlargement frame so that it is adjustable up and down. 2) purchase full spectrum light bulbs 4000 or better yet 5000 lum(? ), 3) Set you camera at its highest zoom setting, adjust the camera focus by the distance between the camera and the coin. Lastly, another couple of points, use a 2 second timer when taking pictures, it allows you time to sit back and keep you body or hands from making shadows. If all possible shoot list and shoot all the same size coins in a row and photo them at the same time… This will keep you lighting consistent. If you are a well to done auction company, you can purchase microscopes designed for coins or at least well suited for it.